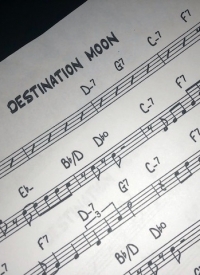 A SWINGING JAZZ SALUTE TO SINATRA! 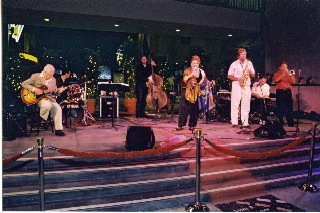 On Tuesday nights from June until Labor Day, the courtyard behind the Kodak Theater in Hollywood becomes an elegant venue for jazz under the stars. The free annual summer series features the talents of such luminaries as Gerald Wilson, Judy Chamberlain, Al Viola, John Clayton, Gordon Goodwin, Donald Vega, Bill Watrous, Terry Gibbs, Francisco Aguabella and Alex Acuna. An optional wine and cheese event during the concert benefits Project Angel Food. Singer Judy Chamberlain and guitarist Al Viola lead a jazz salute to Frank Sinatra on Tuesday August 2 with an all-star band that includes pianist Bill Cunliffe, clarinetist Steve Wilkerson, trumpeter Warren Luening, percussionist Luis Conte, bassist Benjamin May and drummer Ramon Banda. Sinatra would have been 90 this year. The Hollywood and Highland Summer Concert Series is sponsored by Los Angeles jazz station KKJZ, 88.1 FM. The concerts are free. Seating is provided. A $10 optional wine and cheese buffet benefits Project Angel Food. Gourmet pizza is available for speedy delivery to your ringside table in the courtyard before or during the show. Additionally, Hollywood and Highland is home to numerous dining and shopping establishments including Wolfgang Puck’s Vert, California Pizza Kitchen, Koji’s Sushi and Shabu Shabu, Loggia at The Highlands, Louis Vuitton, Sephora, Brookstone and Victoria’s Secret.